Why does anyone even bother to make New Year’s resolutions? Hey, how are those New Year’s resolutions coming along? If you answered: “not so great” you’re not alone. In a survey published by Statistic Brain Research Institute, 45 percent of Americans make resolutions, but only 8 percent are successful in achieving their goals. So why do we even bother? 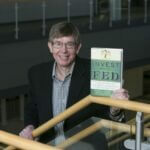 Maybe, says an NIU professor of psychology, it’s because we instinctively aspire. Unlike other species, we possess awareness of self and the ability to review our successes over time. Larissa Barber, an assistant professor in psychology whose research interests include self-regulation and self-control, says it’s that initial high we receive from goal-setting. “Once people make those goals and commit to them, it gives them this feeling of control: ‘I’ve set this goal. I’m committed to it. Now I’m in control.’ It’s a good short-term feeling to have regardless if you ultimately fail,” Barber says. She points to the “False Hope Syndrome,” research published in 2000 by psychologist Janet Polivy of the University of Toronto at Mississauga, which posits that because people think self-change is unrealistically easy to achieve quickly, we don’t set realistic expectations. Polivy’s False Hope Syndrome suggests that people who set the bar out of reach or try to make too many changes at once might abandon their ambitions when they realize they’re not on the track to success. A deeper problem can lurk behind that curtain of defeat, Durik adds. “If you make a resolution and fail, and then you decide that the goal wasn’t really important, that would be a loss if you internalize that failure is inevitable,” she says. “But I don’t think that’s the way it usually works. 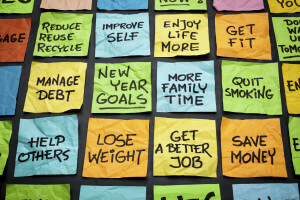 New Year’s resolutions tend to fade away rather than being evaluated later as failures,” says Durik, whose research focuses on motivation in achievement situations.